We’ve written about the e-commerce site 10ngah a few times here on Techzim as one of the examples of local e-commerce startups. This means when people search for their name online, they see the articles we wrote about them when they launched, and they trust that they buy from them. 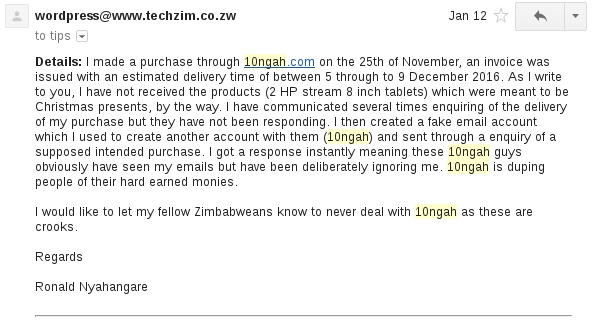 Over the past couple of months though, complaints have been sent to us via email that 10ngah doesn’t always deliver when you buy from them. We had our issues with their unresponsiveness when we tried to reach them last year. They never responded. And this year, after receiving more complaints, we wrote to them again and got no response. In fact, not responding to communication is the major gripe customers have with the e-commerce startup. 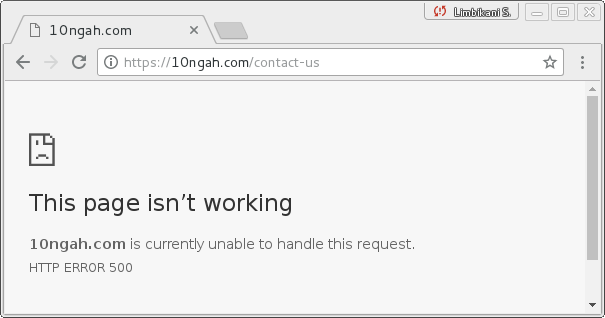 We contacted 10ngah via the email address on their website –customerservice@10ngah.com – to ask them what all this is about. Weeks later, they haven’t responded. Their website doesn’t have a single phone number or physical address to visit. Their ‘contact us’ page is just not working at all. Their Facebook page, which is very active with posts about products being sold, also strangely has no contact information. Our guess is that they are just facing difficulties and will hopefully get their act together. Keeping in touch with customers when there are problems, especially after payment has been made, is non-negotiable though and the startup needs to at least meet this minimum. It could also be that these are not just growing pains but that the people behind 10ngah are just running a scam. Which would just be a shame. We certainly hope this is not the case. Either way, because of the above, where we used to recommend that people buy gadgets on 10ngah (and we get such requests frequently), we now advise them to stay away from 10ngah. I smell a rat. Unless these guys are manufacturing the items they are selling, how then are they able to import these items with the cash shortages and restrictions imposed by the RBZ in place? Such businesses are no longer viable unless you have offshore accounts or some other means of circumventing the foreign currency settlement process. I assume they are cutting their losses and fleecing the remaining clients of their money. The “disappearing act” is a common characteristic of dodgy businesses. Long back before the advent e-commerce the brick & mortar businesses I worked for ALWAYS insisted on a physical site visit and presence of a PTC landline or telephone bill (before mobile tech took over) before transacting with a business as a customer or supplier. My gripe with e-commerce is the troubling scenario we’re faced with now. Typical of fraudsters – one spends money and there is no response. Can lawyers out there please advise on the next course of action for those affected? I agree with the readers whose concerns are raised here that 10ngah simply does not want to talk to their customers. They have a landline that I also used to call when my order made on the 5th 0f December failed to be delivered on the date/s promised. In fact the phone I bought only got delivered first week of January after a person calling himself Junior sent me a Whatsapp message in January. I was promised a smartwatch and a back cover for the phone both of which never came. On asking Junior he did not respond on his Whatsapp number. I suggest if anyone still wants to buy from these guys opt for the cash on delivery option. Delivery a cording to expectation, Responsive Communication and support will make or break any ecommerce. Doesn’t matter how good your deals are or how fancy your site is. Even when you fail to deliver, communicate! Respond! The Consumer Protection Act still applies to them, regardless of being a non brick and mortar business. You can report them to Facebook, citing this Techzim article as a credible endorsement of their bad practices. You can comment on their social network posts, demanding that they respond to your issue.